I don’t talk a lot about Middle-Grade books, but I love them so much! I especially love MG books that tackle really difficult topics. 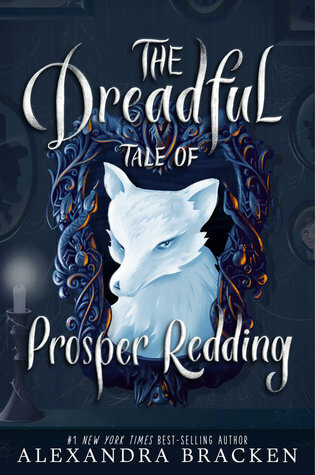 One of my favorites last year was The Dreadful Tale of Prosper Redding. It was the first book I read by Alex Bracken, and I’m reading the sequel right now. I wanted to share some of my thoughts on book 1! Click here for the Synopsis! I would say it’s a pleasure to meet thee, Prosperity Oceanus Redding, but truly, I only anticipate the delights of destroying thy happiness. Prosper is the only unexceptional Redding in his old and storied family history — that is, until he discovers the demon living inside him. Turns out Prosper’s great-great-great-great-great-something grandfather made — and then broke — a contract with a malefactor, a demon who exchanges fortune for eternal servitude. And, weirdly enough, four-thousand-year-old Alastor isn’t exactly the forgiving type. The fiend has reawakened with one purpose — to destroy the family whose success he ensured and who then betrayed him. With only days to break the curse and banish Alastor back to the demon realm, Prosper is playing unwilling host to the fiend, who delights in tormenting him with nasty insults and constant attempts trick him into a contract. Yeah, Prosper will take his future without a side of eternal servitude, thanks. Little does Prosper know, the malefactor’s control over his body grows stronger with each passing night, and there’s a lot Alastor isn’t telling his dim-witted (but admittedly strong-willed) human host. The cover presents the obvious reason I love this book, Alastor. He is a fox, a very sassy malevolent fox. He fills my heart with candy coated joy and fury. The main character of the book Is Prosper Redding. His name is unfortunate because he descends from a long line of Puritans…which is also somewhat unfortunate for him. A few chapters into the book, he finds himself playing host to Alastor the sassy fox Malefactor. A Middle-Grade book essentially focused on demonic possession, sign me up! Of course, to counter all the potential for darkness in this story, there is a lot of humor. Alastor’s sass knows no bounds, and he had me laughing on every other page with his lack of modern knowledge and his old-timey insults. This book is spooky brain candy! I can’t talk about this book without mentioning Chapter 13. Alastor gets a lot of face time, and the whole chapter reads like the movie Hocus Pocus. Because the story takes place in Salem, it is just dripping with Hocus Pocus vibes. The characters and the plot are a lot of fun, but I won’t spoil anything there. I want to talk more about the themes, and why they were so powerful to me. Can you ever really detach from your family? While the rest of his family seems to be born into good luck, Prosper seems born to bad luck. His family has their reasons for keeping a wide berth from Prosper, but it’s still hard to watch him suffer alone so much. Even his twin sister doesn’t always seem to acknowledge his struggles, though she certainly does more than most. His parents are unfortunately absent throughout the book, and I’m curious to see if they’ll play a larger role in the sequel. Despite his bad luck, and lack of support from those closest to him, Proser is still a really positive person. He’s constantly able to make the best of bad situations, and use his time to help other people smile. He’s an amazing character, and I think he will do great things either with or in spite of his Malefactor buddy. Another big theme in the book is Proser trying to find people (or non-human beings) that he can truly trust to have his best interests at heart. He has so many examples of mistrust in his life. When Alastor comes along, it’s clear that he has his own agenda, yet he still does things to help Prosper, if only to keep him alive another day. Their relationship is so complex, and I loved watching them match wits throughout the book. Alastor is a powerful metaphor on his own, as a symbol of the unknown. Even though new people, or experiences can be scary, it’s possible to find good in them if you open yourself up to it. While I don’t advocate taking this message literally and opening yourself up to a demon, I definitely think it’s important for young readers to gain skills for dealing with new life experiences. A possession unlike any other! Some of the effects of Alastor’s possession were super interesting to me. Prosper sweats sulfur, he loses time and control of his body, and Alastor does a lot of things without Prosper’s approval. Any one of these would be traumatizing enough for any 12 year old, but Proser takes it all in stride. The humor, and hopeful vibe just makes you root for Proser through every page. I love that Middle-Grade books are able to tackle these issues without letting tedious drama or ham-fisted romance take over the plot. These stories are usually focused, and powerful which I just adore. Let me know if you have any Middle Grade recommendations for me! Overall, I just love this book. It is something I would have loved when I was younger, I love it now, and I plan to reread it again many times in the future. Keep an eye out for my review of the sequel later this week! I recently bought this ebook! So excited to read it now!